With three feature wins, four heat victories, and seven feature top-fives, it’s safe to say that Chris Milwain had a great year en route to placing third in the year-end OSCAAR Modified standings. Busy getting things prepared for another run, he took some time out of his schedule to offer his thoughts to Short Track Musings. SHORT TRACK MSUINGS: What are your thoughts looking ahead to 2018? CHRIS MILWAIN: Just finished the car, and it’s in getting painted. So we’re back in the modifieds this summer, so it’s at Paul Howse’s now getting painted. We’re going to run that again. It’s been a lot work getting ready. CHRIS: Just to run consistent. Last year, I had a pretty good run. I won quite a few races, but I had quite a few motor issues. So hopefully we can get around those motor issues, and get more consistent for the points. STM: What track are you most looking forward? STM: Based on how Autumn Colours went, I can see that. On that note, though, what are your thoughts reflecting back on last season? CHRIS: Pretty satisfied. I won three features. I wish I didn’t have the motor issues, so hopefully we can get fixed up so it doesn’t happen anymore because I think I would’ve had a lot better run in the points. I didn’t really like how OSCAAR could bring everyone in at the end of the day when it comes to a three car point car – between myself, (A.J.) Emms and the 99 (Luke Gignac), I think OSCAAR needs to look at that. I heard they put a rule in place – but I’m not sure. An American drove over me on the Friday and I was leading the race, and he came in last second; I couldn’t react that fast, but it took me out of that one. That made me start 15th in the main, and then the 99 pulled more points on me, too. If I won that heat, and done really good in the feature and finished ahead of the 99, it would’ve been down to a couple points. CHRIS: Once that guy took me out, I should’ve just loaded up and went home. We’re running so tight in points, and then that ruined my whole weekend right there, and then I totaled the car on Sunday. Hopefully they do something. I talked to Dave about that, too. Like, we want other racers to come, but at the end of the season, that hurts it. Not just me, but it hurts anybody that is trying to place in points. STM: I know some series they put in a rule where you have to run so many races to be eligible for the final event. CHRIS: The Hobby cars are like that. If I show up mid-season, I have to run three races straight at the back, in the heats and the feature. Then after that, I can qualify in a regular way – which is fair. Like, I think the modified division took off. I think it’s going to be really big in 2018. We’ve got a couple super (late model) guys that are dropping down to modifieds, and then there’s other modified guys that are bringing them out – got them repaired, and ready to go. So, it should be quite interesting. STM: I know I’m definitely looking forward to it, as a glance at the roster and seeing who is putting cars together. I mean, there should be about 20 modifieds a week this year. Now I know we’ve talked about some of the frustrations of the year, but let’s look at the positives. What was the most memorable moment for you? 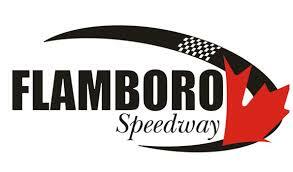 CHRIS: The feature victory at Flamboro. I started like ninth and A.J. started on pole, and I ended up coming from there and won it. That was good. That was one of the best nights that I’ve ever had at Flamboro, and I’ve ran the Hobby car there before I ended up in the modified. There was a good outside groove, and A.J. is good to run with. He gives you respect, right? He doesn’t want to bang wheels, he wants to race clean, so you know you can put a wheel inside him. The 99 is pretty good, too. There are a few guys that you have to watch, but those guys are pretty clean. That was probably one of my favourite wins because I didn’t just start on the pole and win it. I came from back in the crowd, and made my way in. STM: Looking at the division as a whole right now, what are your thoughts looking at the overall state of the modified division right now? CHRIS: I think we have a pretty good division. Going into 2018, it’s gotten a lot more people interested, like the super guys. It’s probably one of the more reasonable classes to run, as far as cost. It’s fast, and the cars handle. It’s good racing, I think, all around. We’ve had our few wrecks and crashes, but I think the fans showed a good interest in the modifieds, too. We had good crowds every night, so we’re moving in the right direction. I just hope OSCAAR polices what they need to police to keep all the racers interest there. The supers, they’re kind of going another direction now, and everybody is blaming OSCAAR and Dave. I don’t think that’s the truth; I think there are a lot of other factors. I think one day Dave will get it back. I think we’re going to be the leading show. So hopefully, Dave really polices it. I think he will be able to put some extra effort into it this year with just having the modifieds and the Hot Rods, and then Pro Midgets take care of themselves. STM: Well, Charles pretty much handles everything there…. I will say I’m looking forward to the two Kawartha events. I know those will be good, fast races, and I think we’ll have a helluva car count. I know a lot of guys are looking forward to that one. I’m glad that we got it back on the schedule. I wouldn’t mind one at Delaware, as I kind of miss going down to Delaware – but they’re doing their own thing.